Tottenham cut Leicester's lead at the top of the Premier League to five points as Harry Kane inspired Spurs to a routine win over Bournemouth. Kane turned in Kyle Walker's cross after 43 seconds and then latched onto Dele Alli's pass to finish left-footed past Artur Boruc to double the lead. The England striker is now the Premier League's top scorer with 21 goals. Christian Eriksen tapped in Tottenham's third from close range after Boruc had pushed out Kane's shot from 25 yards. Mid-table Bournemouth, who had won three successive league games before their trip to White Hart Lane, rarely threatened. Kane's hat-trick at Bournemouth in October ended a poor run of goalscoring form for the 22-year-old. He has been in supreme nick for his club since then, with his brace against the Cherries taking his tally to 23 goals in his past 30 appearances for Spurs. His early opener made him the first player to reach 20 Premier League goals this season, and he becomes the fifth Englishman to pass that milestone in two consecutive Premier League seasons - joining Andy Cole, Les Ferdinand, Robbie Fowler and Alan Shearer. Not content with scoring twice and creating the third when Boruc spilled his long-range shot, Kane later made a last-ditch challenge inside his own six-yard box to deny Bournemouth striker Josh King. Team of the week: Who might be the new Ian Wright? One of the most eye-catching features of Tottenham's play this season has been the willingness of their full-backs to push forward at every opportunity, while still maintaining a solid defensive base thanks to their two holding midfielders. Walker and Danny Rose were always available outlets in the first period, when Spurs were at their most dangerous, Walker creating Kane's first goal with a wonderful whipped cross. Both have been named in Roy Hodgson's England squad for the friendly matches against Germany (26 March) and Netherlands (29 March). 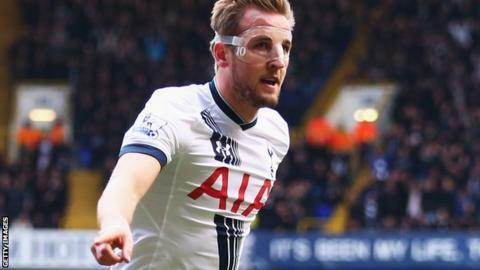 Kane has equalled his Premier League goal tally from 2014-15. Alli has assisted Kane for seven Premier League goals this season, the most assists from one player to another in 2015-16. Two of the three fastest goals scored in the Premier League this season have been in the Spurs/Bournemouth fixture (Ritchie 49 seconds, Kane 43 seconds). Tottenham head coach Mauricio Pochettino: "I'm very happy with the collective performance, I thought we were fantastic today. "It was important to score early, and then we showed a strong mentality in the way we managed the game. We played well against a very good team - we showed a mature performance. "It's important to get some time to analyse - 90% of the squad will be with their national teams and I think it's a good moment to analyse during this period." Bournemouth manager Eddie Howe: "It was a really bad day for us. We had the worst possible start, we were slow out of the traps and we weren't ourselves at all in the first half. It was a poor display. "I was hugely frustrated because, even when we don't play well, you see a clear philosophy and a way of playing. I honestly couldn't tell what we were trying to do in the first half. It was disjointed and we had no rhythm. "When you come here and you don't bring your best game, it's going to be very difficult." Following the international break, Tottenham have two games which could go a long way to deciding the destination of the Premier League title - Liverpool at Anfield (2 April) followed by Manchester United at home (10 April). Bournemouth, who remain 13th and are 12 points above the relegation zone after Newcastle's draw with Sunderland earlier on Sunday, host Manchester City on 2 April. Match ends, Tottenham Hotspur 3, Bournemouth 0. Second Half ends, Tottenham Hotspur 3, Bournemouth 0. Attempt missed. Christian Eriksen (Tottenham Hotspur) right footed shot from outside the box is too high. Assisted by Nacer Chadli. Danny Rose (Tottenham Hotspur) wins a free kick on the left wing. Foul by Lewis Grabban (Bournemouth). Substitution, Tottenham Hotspur. Nacer Chadli replaces Eric Dier. Attempt missed. Harry Kane (Tottenham Hotspur) right footed shot from outside the box is close, but misses to the left. Assisted by Kevin Wimmer. Attempt blocked. Christian Eriksen (Tottenham Hotspur) right footed shot from the right side of the box is blocked. Attempt saved. Ryan Mason (Tottenham Hotspur) left footed shot from the left side of the box is saved in the centre of the goal. Assisted by Harry Kane. Substitution, Tottenham Hotspur. Ryan Mason replaces Dele Alli. Attempt missed. Dele Alli (Tottenham Hotspur) right footed shot from the centre of the box misses to the left. Assisted by Christian Eriksen. Corner, Bournemouth. Conceded by Toby Alderweireld. Attempt missed. Eric Dier (Tottenham Hotspur) right footed shot from outside the box misses to the left. Offside, Tottenham Hotspur. Harry Kane tries a through ball, but Dele Alli is caught offside. Foul by Dele Alli (Tottenham Hotspur). Eunan O'Kane (Bournemouth) wins a free kick on the right wing. Substitution, Bournemouth. Marc Pugh replaces Max Gradel. Attempt missed. Lewis Grabban (Bournemouth) header from the centre of the box is close, but misses to the left. Assisted by Andrew Surman with a cross. Substitution, Tottenham Hotspur. Tom Carroll replaces Erik Lamela. Delay in match Kevin Wimmer (Tottenham Hotspur) because of an injury. Simon Francis (Bournemouth) is shown the yellow card for a bad foul. Harry Kane (Tottenham Hotspur) wins a free kick in the defensive half. Foul by Simon Francis (Bournemouth). Offside, Bournemouth. Matt Ritchie tries a through ball, but Max Gradel is caught offside. Adam Smith (Bournemouth) wins a free kick on the right wing. Corner, Bournemouth. Conceded by Harry Kane. Goal! Tottenham Hotspur 3, Bournemouth 0. Christian Eriksen (Tottenham Hotspur) right footed shot from the centre of the box to the bottom right corner. Attempt saved. Harry Kane (Tottenham Hotspur) right footed shot from outside the box is saved in the bottom left corner. Assisted by Erik Lamela. Offside, Bournemouth. Andrew Surman tries a through ball, but Joshua King is caught offside.